DYNAMIC TESTING WAS EXPERIENCING SERIOUS NOISE ISSUES, AND CAME TO US TO PROVIDE A SOLUTION FOR (2) 4-SIDED ENCLOSURES. In the heart if Texas, Milan middle school had a noise reverberation problem typical to institution spaces such as gyms, cafeterias, auditorium and general purpose rooms. We all associate the echoes, noise and reverberation of sound with gyms, pool areas & large auditorium / multipurpose rooms and certainly can relate to the high noise levels in these types of rooms. In this middle school gymnasium (a problem in virtual all gymnasiums), the sound bounces off the walls more than the basketballs. Do to the volume and space in these rooms and lack of noise absorbents, the noise grows and creates echoes and reverberation seriously impeding speech intelligibility. When the gym was in use, the conversation next to you was indistinguishable from the conversation across the floor. During sporting events, the noise became unbearable with the gym full of fans, parents and students. The noise levels at sporting events Is already an unhealthy exposure to high decibels especially with no acoustic noise control absorbents in place. University of Florida finds an economic resolution for echo problems in office…. All Noise Control knew that our cost effective wall panels were the ideal product and due to the small space and the conscious effort to reduce as much reflective surface as possible, recommended that wall panels be fit inside the room to the ceiling. There were orders and manufactured to their needed specs and fit snugly up to the drop ceiling eliminating any potential for noise reflection. A & C Mold Company contacted All Noise Control and after discussing their application All Noise Control provided A & C Mold Company with a solution suggesting using the acoustical product ANC-AB12 that would help them with soundproofing issues they are experiencing. 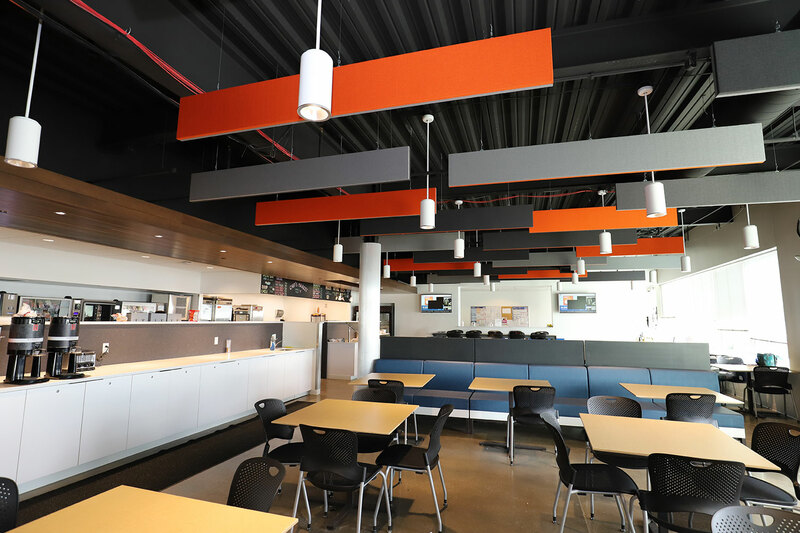 Powertech Interiors contacted All Noise Control; they need to find a product that reduces sound from transmitting through walls, floors, and ceiling. As well as soundproofing an existing spaces. Powertech Interiors felt 100% confident that their decision to use All Noise Control was the right decision.